My little boy, who will be ready for kindergarten in less than a week, exciting? Definitely. Nervous? Extremely, much more then when I first going there myself, not that I remember. So, after his request, I decide to give him a little home made lunch box featuring his favorite characters: the angry bird trio. Just something to make him feel happy and comfortable. 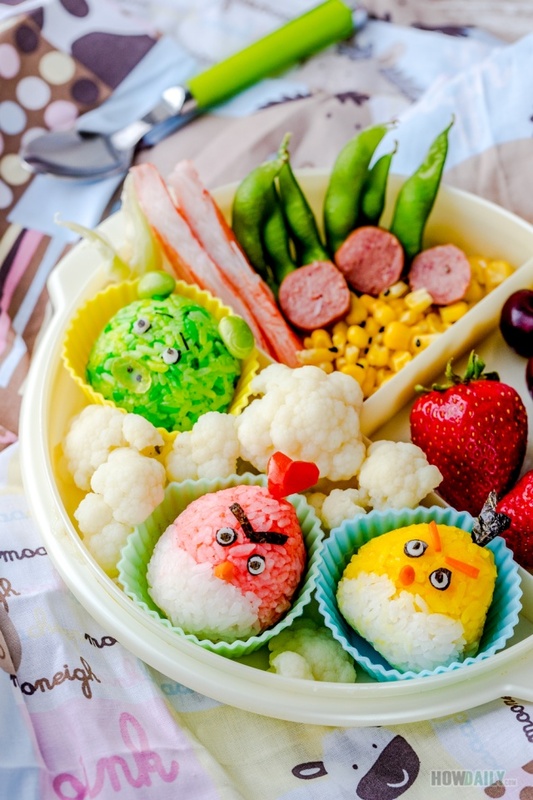 Now, this will be my first ever lunch box for him, so I would go a little on the cute side with some of the easier food. Pardon me if it’s not as neat as those fancy bento, but I think this will do. The characters are not hard: three characters in green, yellow and of course red. To make sure he is packed with enough nutrition, I would mix in things like egg yolk (for yellow rice), saute spinach or mashed pea (green rice), and steamed carrot/tomato for the red rice. Now the carrot rice might not be deep red, if you want it darker but still natural, try to steam a small chunk of beet and mash it in too. The features are what I would say a bit tedious if you don’t have those cute face puncher (like me). So I would take a straw to pinch large white circles, and scissor for the brows and etc. You can cook rice before hand and keep them warm to quickly finish this in the morning. Just make sure to prepare all other vegetable so they could be ready to be steamed. For finishing touch, I would add anything from hot dog, cauliflower, corn and strawberries to fill empty space. 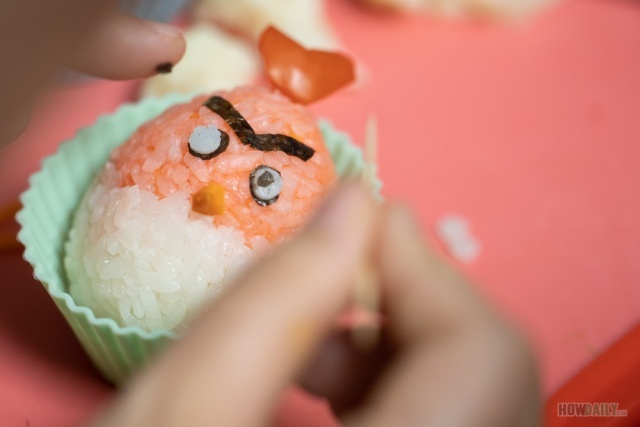 To separate these, use your silicon cup cake or liner to line the rice ball (so it doesn’t get mushy). So there, an easy lunch box for the boy, oh and he doesn’t have to warm it up. Just bring along some napkin and maybe a cute small pick in there for the fruit. 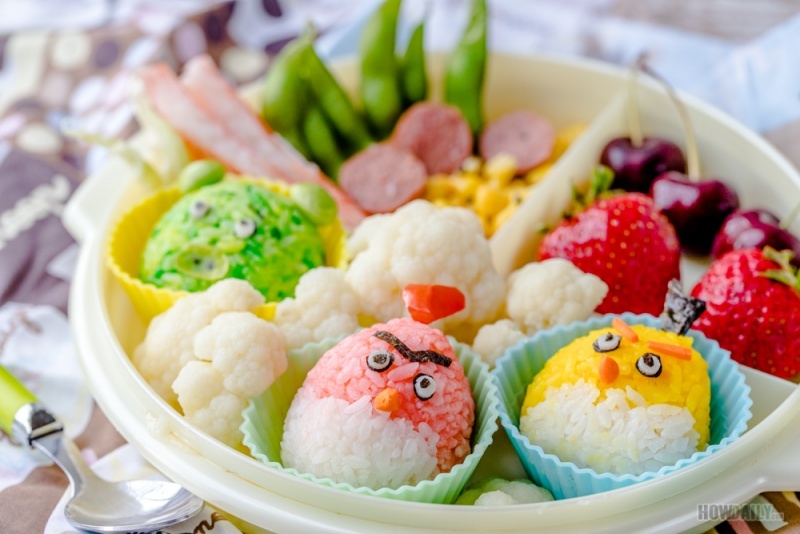 Cute onigiri rice balls packed into bento lunch box featuring the popular angry birds trio: red, yellow and green pig. 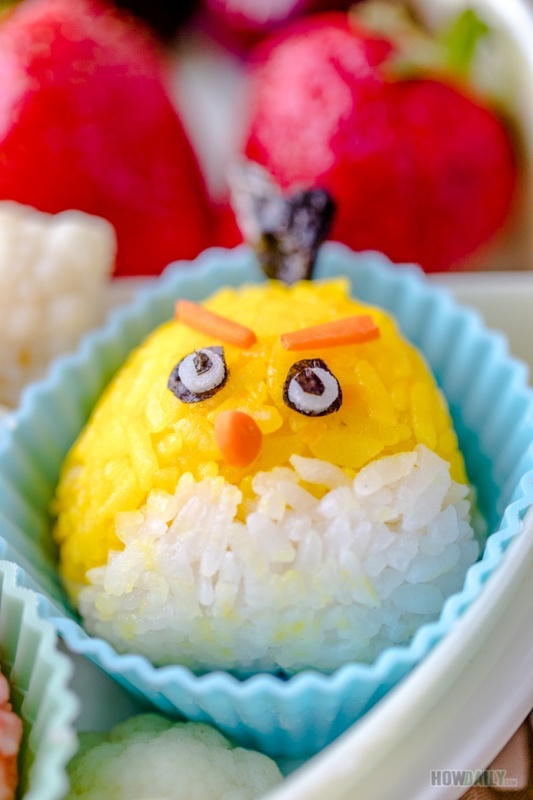 Just your usual food to color the rice and decorate away for your kiddo. Cook sushi rice according to bag instructions or follow our guide here. Do not season the rice yet, as we will divide and adjust the flavor a bit. Divide sushi rice into 4 portions for seasoning/mixing: red, yellow, green and white. If use Spinach: lightly saute then puree and mix to the rice, seasoned with some sea salt. 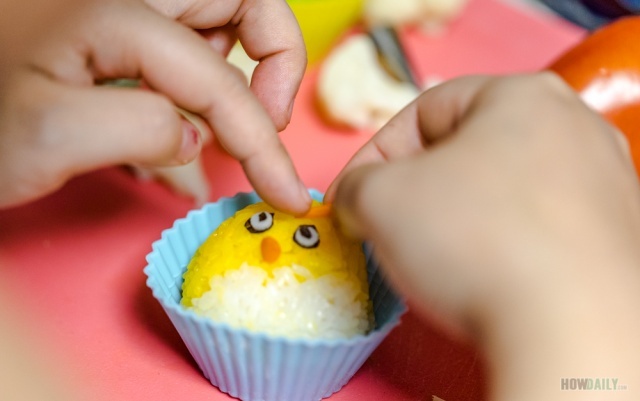 Place a plastic wrap on your hand, spoon the mixed green rice on top. Tuck, close and squeeze to form a round ball. You will now have the body of green pig. Steam 2 baby carrots(reserved the 2 pointed end for beaks) than puree or smash them and mix to a portion of rice. 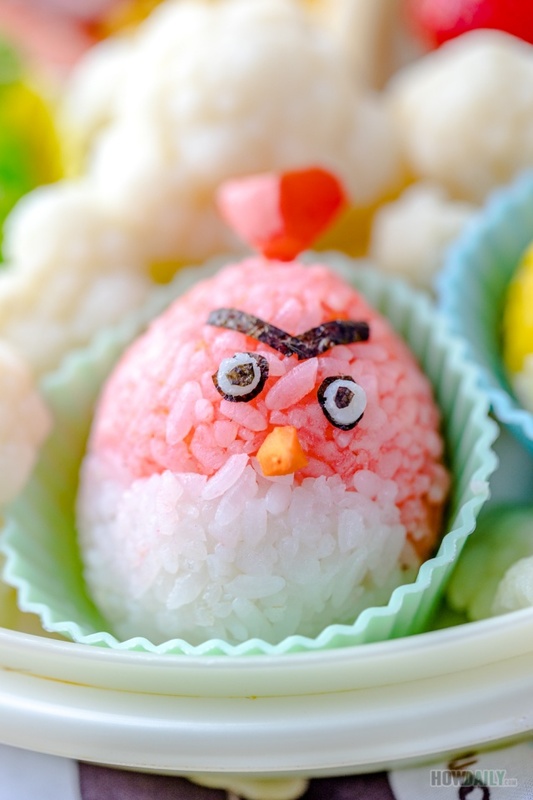 Similar to above, shape the red rice into a sphere. Then push one side down to table to flatten in into half a sphere. Now add half of the white rice portion to the flatten part, then twist and shape into round or egg like to resemble the red bird body. Mix 1 boiled egg yolk to a portion of rice to make yellow rice. 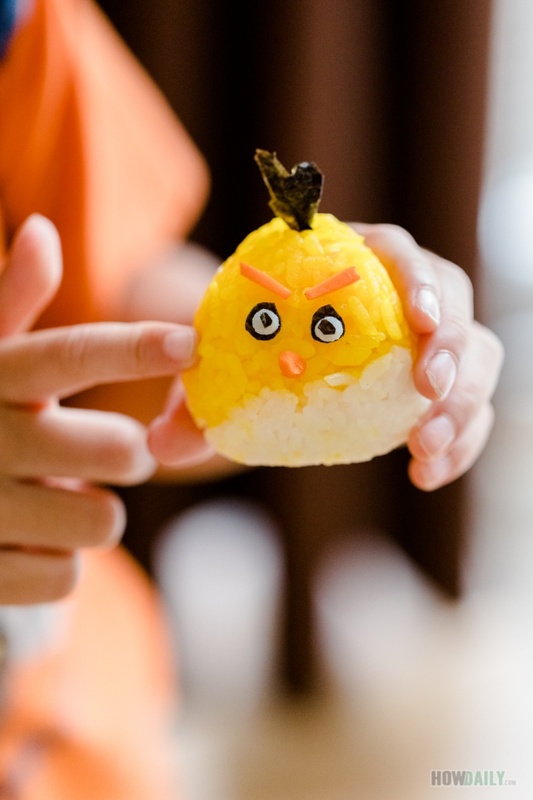 Similar to red bird, form and shape yellow rice and remaining 1/2 portion white rice together but into a triangle instead. Dispatch mayonnaise in a small cup, you will use it to glue heavier features onto rice balls. Use small scissor to cut out 2 brows for the red bird, 6 larger circles for eyes background and 6 smaller dots for pupils. Also cut 2 piece of funky crown out of nori. Use a straw or similar to cut out 6 circles of the boiled egg white. Cut a heart shape out of tomato to make crown for the red bird. Also two eyebrows for the yellow bird, you can use either tomato or carrot for this. 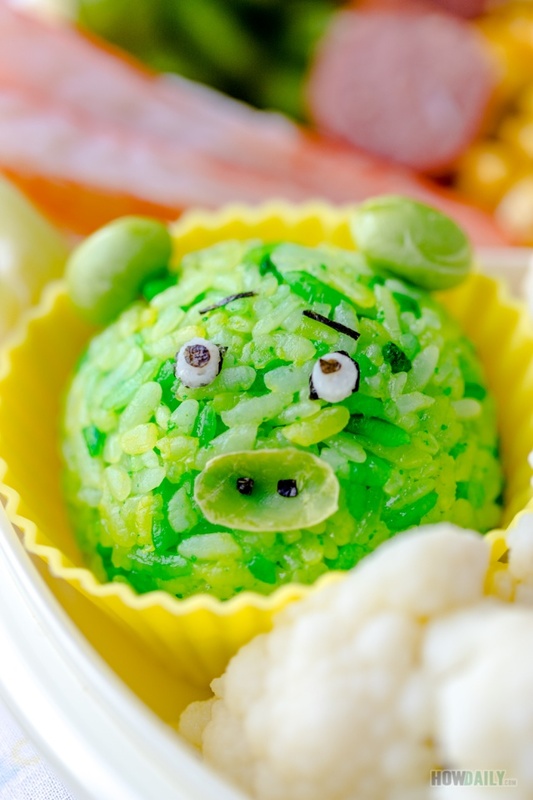 The pig mouth nose can be cut out from cucumber, green broccoli, or just use the shell of the edaname. Use two inner peas for pig ears. Now just glue all features onto each respective bird. For heavier parts such as beaks, crown, pig ear, use a tooth pick or just crack some chips into long shafts to connect them. 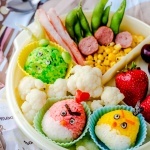 Arrange each bird and pig into your lunch box. Fill lunch box with some veggies, boiled hotdog, sausage and fruits.